Saturday August 16 Pleasant & cool. I kept busy at odd jobs here & there all A.M. over to rose's three or four times of errands, Lena & George got beef, crackens &c for her to try making "Beef loaf" in which had good success of course G_s folks had part of it. I helped Lena about apple pies, & spent P.M. at home doing repairing. Charlotte in a few minutes. 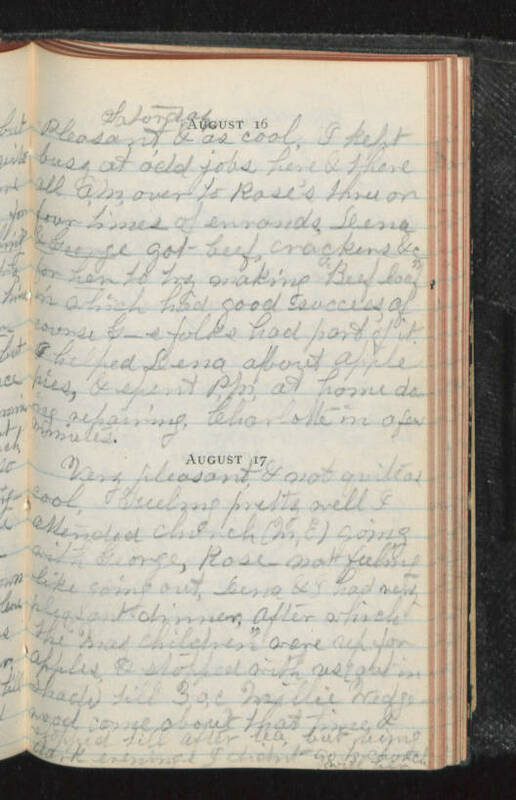 August 17 Very pleasant & not quite as cool, Feeling pretty well I attended church (M.E.) going with George, Rose - not feeling like going out, Lena & I had very pleasant dinner. After which the "May children" were up for apples & stopped with us (out in shade) till 3 o,c, Millie Wedgewood came about that time & stopped till after tea, but being dark evening I didn't go to church with her.